Cleveron is proud to announce its Software Programmer, Rauno Viskus has been a key member of the team that won the recent European Innovation Academy’s Extreme Accelerator Award 2014. The winning team collaborated to form a venture called MashWithMe. Ultimately it offers innovative music and sound recording collaborative tools for use by the music lovers’ community worldwide. Rauno was joined at the event by fellow Cleveron colleagues; IT Project Manager Helen Muidik and Senior Software Developer Alan Ibrus. They also enjoyed the opportunity to gain insight from business experts and to network with other interested professionals. The Awards were held as part of the European Innovation Academy, an annual technology entrepreneurship education program. It was held in Nice, in the south of France, from 7th – 25th July. The event attracts entrepreneurs and business developers from across the European Union and beyond. Event offers expert advice from experienced entrepreneurs and business leaders. Furthermore, it is a chance to network and work with like-minded delegates. We are very proud of Rauno and the MashWithMe team’s win. It reflects the professionalism and excellent expert knowledge that Rauno brings to his role at Cleveron. He is the complete professional, with a great attitude and innovative approach to problem-solving. Offering fresh ideas and perfect solutions along with a great sense of humour, makes him a key part of our team. We like to encourage our employees to broaden their horizons, to try new things and to expand their knowledge. So I was delighted that Helen and Alan were able to attend as well. The teams’ participation at the European Innovation Academy is a perfect example of this. Of course this professional growth is at the heart of what makes the Cleveron team so good at what it does and is reflected in our products and services. Whilst he is taking part in ventures such as MashWithMe, Rauno also remains a central part of the development team at Cleveron. He is constantly developing the client facing tool for managing the company’s managed networks around the world. I work with a number of complicated processes every day, which I really enjoy! As a software developer I revel in the challenges of automating and optimizing processes as well as the continuous integration, testing, development and managing deployment. I gain great satisfaction from knowing a system works well. Cleveron relies upon my skill to make many of its products and services run properly, safeguarding the interests of our customers. The program gave excellent guidance on key considerations for anyone looking to establish or grow a company, the best ways to develop and realize ideas and how to attract and involve investors. What really struck me was just how important it is to create an effective team that works well together, moving towards a common goal and delivers the required results. These are highly relevant skills and something I feel I can use in my role at Cleveron. 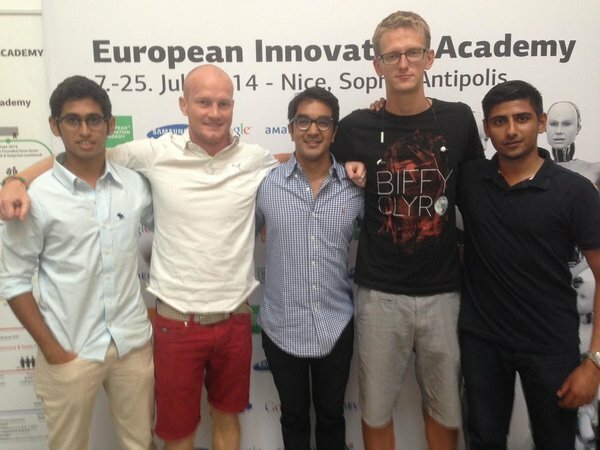 Alan was equally enthused by the advice and support provided by the European Innovation Academy, as he explained. Whilst three weeks is quite a long period for such an event, I found it very exciting and it broadened my horizons considerably. As a software developer, it offered me an utterly refreshing and educative challenge. It was an illuminating opportunity to see how processes work and how things are done in large successful enterprises. Personally the program offered me the chance to develop an excellent mobile app under pressure, as well as experiencing different business roles (in my case sales and marketing activities) and the chance to network with and talk to people from an impressive 52 different countries!